Kongnapped is the fourth Funky's Flights mission in the Game Boy Advance port of Donkey Kong Country 2. It can be played in Krazy Kremland. In this mission, Diddy Kong must rescue six Kongs around a Zinger hive. The penultimate Funky's Flights mission, Kongnapped 2, is a sequel to this mission. Diddy must rescue six out of the ten Tiny Kong lookalikes. 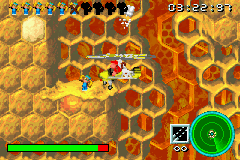 Multiple Zingers are found flying around the hive, and they may be defeated by shooting them or ramming into them, although the latter option damages the Gyrocopter. To rescue a Kong, Diddy must land near one and deliver them to the helipad. The Kongs can be found either standing on the ground in certain spots, or being carried around by a Zinger. If a Kong is carried by a Zinger, Diddy must defeat the enemy by shooting it, causing the Kong to fall to the ground. A few ammo boxes and time-increasing clocks can be found spread throughout the level. "Come on, dudes, I need your help. Zingers have attacked Kong Island and kidnapped members of the Kong family. Go and rescue them. To pick up a passenger, land beside them and they will jump right in. Once they're on board, take them back to the helipad. You must rescue six hostages to complete this mission. She's all gassed up and ready to go. You have five minutes flying time." "Well done. Take this Hero Coin as a small reward." This page was last edited on November 19, 2018, at 01:11.